What’s your Repeat One today? Or this week? Or this month? The set began with “Sigh No More” and the crowd roared. It was the perfect set, balanced with beloved hits and new songs like “Bellow My Feet,” “Lover of the Light,” and “Lovers Eyes.” Bringing it to the grand closing with “The Cave.” I’m sure I wasn’t the only one on cloud nine at that point. I’m still smiling. I’m positive this set brought the biggest crowd to the main stage. Mumford, Winston, Lovett, and Dwane, along with other supporting musicians, did an excellent job that day. The intimate lyrics and their love for their music made the Wakarusa stop an unforgettable show. I giggled when I read “If loving hippie makes me a hippie…” on @DocMurda‘s review of Day 2 of LouFest. I have been labeled that before, a hippie. The first time someone called me a hippie was in El Salvador in 2001. I was out on the street hanging out with one of my best friends (because we do that in El Salvador) when we saw a girl walk by, her outfit was a bit different and I asked if she was a hippie and he said “no, she’s not. YOU are.” After that, it’s happened a few times. Whatever, let me get to the point of this post before I forget it or go too far off a branch. At my yoga class yesterday, the instructor had a playlist going on (I love that about my studio, there are some people that practice without music and I just don’t like that). In the middle of trying to hold triangle, “Om Nashi Me” started playing. This is my very favorite Edward Sharpe And The Magnetic Zeros song. So this mile-long smile took over my face and this feeling that I can’t even describe got in me. I didn’t know if I wanted to hold the pose forever, or just start chanting along, or leave the pose and dance. It was awesome. So I wanted to share that on this blog. Music is amazing. And me encanta that everyone on the Sandy Beats collective is on that same page. Music moves us. Now enjoy the song. It’s an old one, from the first album, but SO good. I’m about to share some new John Mayer music, so I thought I’d share this for Throwback Thursday before I get judged! Ha! Read it, will you? I love John Clayton Mayer. I knew he was playing in Tulsa on Sept. 3, but I wasn’t planning to attend the show. At least I wasn’t, until I saw the live broadcast of his Sept. 1 show at Colorado’s Red Rocks. That’s when I remembered how great he is and realized how much I’d regret it if I missed out on the Tulsa show. After all, it was just a two-hour drive and a ticket that wasn’t in my budget. But I had to do it. So I bought my ticket the day before the show and got on the road after leaving work on Friday. Lucky for me, the BOK Center performance wasn’t sold out. The opening act was Owl City. Which was not impressive at all, but everyone did stand up for their hit “Fireflies.” I was fine with sitting down for their entire set. After all, I wasn’t there to see them. When the schedule of shows for Mayer’s Summer tour came out, I thought it listed Train as the supporting act. I would have been a lot happier with Train. Or with Michael Franti & Spearhead, the supporting act for the winter part of Mayer’s Battle Studies tour. Mayer’s set started out with “Vultures,” from his Continuum album. Which he introduced with riffs from The Band‘s “Chest Fever.” He followed it with the Mayer classics “Clarity” and “No Such Thing.” The entire arena was singing along with these songs, including me. The next song is when I started to fly, because he played “Ain’t No Sunshine” with a reggae-flavored intro and a guitar solo that made me melt. Need I say more? Later in the show he played The Rolling Stone‘s “Beast of Burden” along with “Perfectly Lonely,” from his latest album, Battle Studies. After that winner combination and an instrumental jam session, which rightfully earned drummer Keith Carlock a prolonged ovation, the show went into a mini-acoustic set. With Bob Dylan‘s “Don’t Think it Twice, It’s Alright” and “Your Body Is A Wonderland,” Mayer kept everyone in the audience happy. The 7-piece band accompanying Mayer is an impressive one. 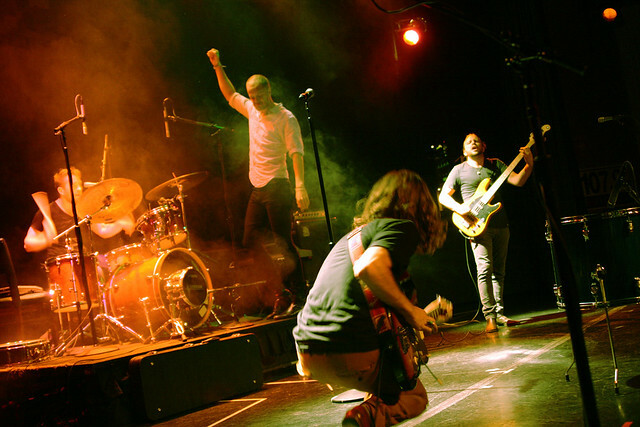 In addition to Carlock, the band is made up by David Ryan Harris (guitar), Robbie McIntosh (guitar), Sean Hurley (bass), Bob Reynolds (saxophone, flute), Bryan Lipps (trumpet), and Charlie Wilson (keyboards). Each of them had a moment to shine during the show. Like Wilson during “Who Says.” Despite listening to that song (it was the first single of Battle Studies) so many times before, this was the first time I noticed the delicate piano notes in its middle. Those notes really glue the song together. And now when I listen to that song I wait for them — so much soul in just a couple of notes. Mayer ended with “Edge of Desire” as encore while a video compilation from the winter part of the tour played on the screen behind him. It was perfect. I got out of the BOK Center with the biggest smile, wishing I wasn’t alone, but still so high from the amazing musical evening I had just experienced. I was blown away, as I’m sure you would be, if you get to one of his shows. The set was a great mixed of old and new favorites. Here’s the setlist of the night. Just in case you want to make a play list, like I did. And here are a few of my favorite photos of the night (they’re all from that perfect encore) in black/white. Words by B “Cafe con Leche” Gutierrez. Photos by Nicole Riley. After coming back from Wakarusa I thought I’d be OK to go without live music for a while, but after I got an update from @georgesmajestic about a no-cover Wakarusa Post-Party featuring The Giving Tree Band, I was all over it! So I called a couple of friends and headed over to George’s Majestic Lounge. I left my camera at home after being glued to it for four days straight at the festival, and keeping in mind with the 1500+ photos I had to look through and edit. So I decided to take it easy and just go for the music. You see, that night I thought I was doing my soul a favor by not taking my camera. But I was so wrong. 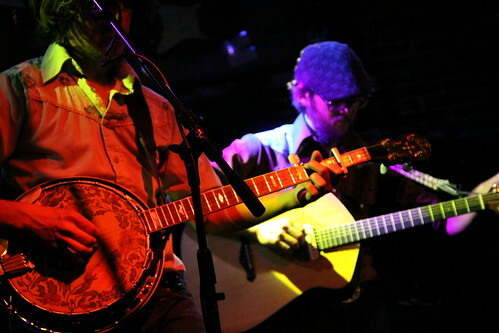 About two songs into their set, I knew I liked The Giving Tree Band. Two songs later, I realized I had to write a review. It all came together when I saw someone taking photos of the show, after talking to her, Nicole agreed to showcase her photos on BOT. So this is my shout-out to Nicole Riley! 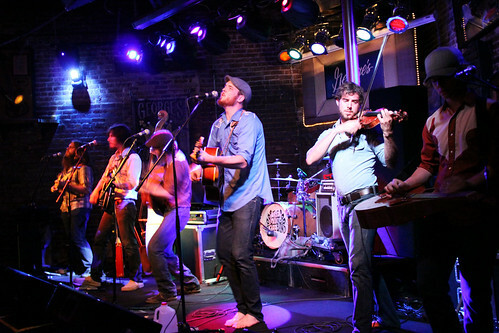 The Giving Tree Band was one of Waka Winter Classic winner bands. They got their spot (two sets) at Wakarusa at the WWC at Kinetic Playground in Chicago. I didn’t catch them at the festival, but I heard of them and their great music. I also heard it was a big band. They all fit on the lounge stage at George’s, but barely. There are currently eight band members: Todd Fink (Banjo), Eric Fink (Guitar), Andy Goss (Guitar), Phil Roach (Violin), Erik Norman (Mandolin), Scott Woods (Slide), Justin Forsythe (Drums), and Patrick Burke (Upright Bass). All of them sing, at least that’s what I remember. There were a couple of songs where all their voices would come together to form beatlesque harmonies, and I’m thinking of “Peace on the Mountain” and “Circles” when I say this. 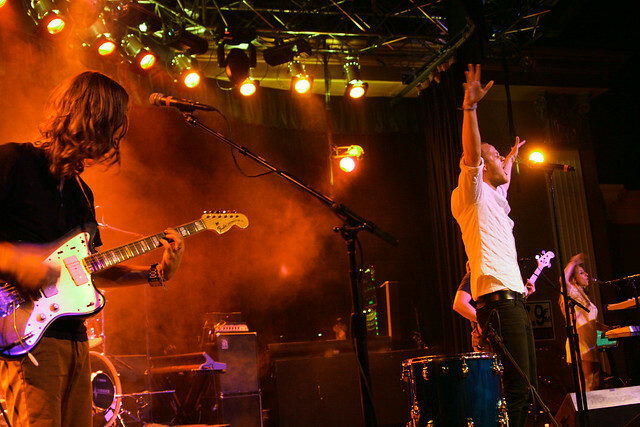 On Friday, Sept. 16, Imagine Dragons played a show at Club Madrid at Sunset Station in Las Vegas. The show was part of the afterparty for the 107.9FM listeners appreciation show that featured Lit. The Dragons were at home in Vegas, and looking around the crowd, it was clear that Club Madrid was full of fans and friends and not tourists. Everybody knew the songs and sang along, clapped at the right times, jumped and danced through the whole show. Slightly Stoopid filled up the Revival Tent. I don’t think another soul could fit in there, in fact, Hash Browns got a little overwhelmed and left me. I thought I had lost her, but no, she left me. I struggled going around the people when trying to get better angles for my shots, all the while soaking in the love from the fans (as well as some fumes and sweat, ya’ll).